Paul Strassmann’s blog: 096 Trade War With China? 096 Trade War With China? From an investor standpoint these liabilities may reflect a detractions from US wealth. It is the purpose of this blog to explore the potential consequences of a trade war with China. Total 2017 US imports from China were $506 million or 17% of total global imports by US. China continues to be the largest US trading partner (2). US imports from China consist primarily of high-tech goods that have been assembled from an globally widespread value chain of suppliers. China imports represent 2.6% of its GDP and make the US its largest customer. Any trade war with China would affect both the Chinese as well as the US economy. It would certainly affect the stock market outlook of US investors. 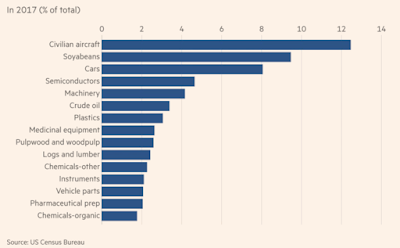 30% of the US imports are high-value goods. That places China as benefiting from the international trade. 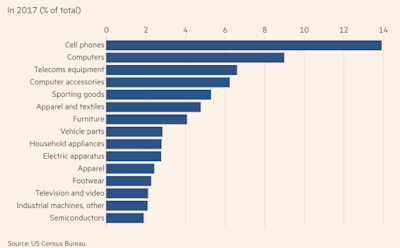 US imports are items that are produced in robotic factories that use little labor. Cutting imports would not materially increase US employment. Any US demand for a significant reduction in imports as well as a further curtailment of government support of technology investments would result in a disruption in current trade balances. Therefore, a reduction in imports to the US would be difficult. Rising tariffs would also drive the marketing of cell phones, computers and telecom equipment to other countries, which is what the Chinese government wishes to do anyway. Meanwhile the US market would be supplied with more expensive equipment, possibly leaving the US with less advanced technologies. The problem with decreasing the trade deficit with increasing the export of civilian aircraft, soyabeans and cars has limits imposed by capacity or competition. Cutting the deficit through increasing exports is not feasible even if US promotes growth in soyabeans, wood pulp and lumber. Presently the US has presented China with an ultimatum on trade. China is to reduce the US-China trade imbalance by $100 Billion in the next 12 months and by another $100 Billion after June 1 2019. China should also immediately eliminate all “market-distorting subsidies” that result in an excess capacity of its industries. Such changes would force a change in Chinese strategic plans that have been already approved. China would also eliminate technology-related requirements for any joint ventures with US companies. China would also have to stop targeting US technologies through cyber operations, economic espionage, counterfeiting and piracy. Moreover, China would have to withdraw from requesting the World Trade Organization to become involved in tariff actions that involve intellectual property. China would have to immediately cease all retaliatory actions currently being pursued. It will not oppose, challenge, or retaliate against US imposition of restrictions on investments from China in sensitive US technology sectors, such as projects critical to US national security. By July 1 2020, China will reduce all tariffs and will open access to services and farm products such as the US specifies. The call for a reduction of the bilateral deficits by $200 Billion would require the Chinese to take complete control over international trade, which US specified that this should not be done. However, the US demands ignore showing how the requested measures will increase US employment. China cannot accept measures that would prevent it from upgrading its technologies as it tries to increase its GDP. The notion that the US can insist on an unrestricted access for investment in China while reserving the right to restrict Chinese investments in the US is also unacceptable to the Chinese. China exports to the US dwarf those from the US to China. That is driven by differences in their respective growth rates. China's GNP has already exceeded the GNP of the US and is growing at annual rates that are at least three times greater. If one of the objectives of the current trade negotiations is to slow down China's growth prospects, that is politically not feasible. The US is now proceeding with trade negotiations that are not acceptable to China. Unless changes are made in US trade policies as well as in Chinese plans, the prospects of a trade war are high. Unless resolved, US retirement investors will find a depreciation in the current premium valuations of their holdings. A trade war would be bad news for investors who are now considering how to rebalance their portfolios.